For 2 seater version T5 with Round Locators. Fantastic carpets at fantastic price, fast service too! 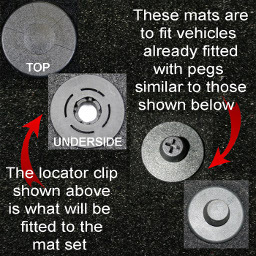 Ordered mid-grey mats for cab with silver/black trim (for my T6 camper) and they are fabulous. Ordered at the weekend and they arrived on Wednesday, superb fit, very nice and neatly made, they look really smart. Could you make foldable ones for the habitation area please? They do them in Germany - the carpet folds into 3 pieces so the downatairs bed can be rolled out and the mat simply folded back rather than having to be removed or rolled up - I would love one like that to match my new mats! Thanks! Very pleased with the quality & fit. Super fast service & delivery. Would recommend to anyone. Good quality product nicely done, willing to make a matching bespoke carpet to match the front for my camper. Really impressed with the quality, feel and fit of the product. Also very rapid serviced and delivery. Very pleased with the mat. Fits our T6 California Beach perfectly. Very good quality. Would recommend. Good price too and very quick delivery. Brilliant price for a great carpet. Excellent fit, superfast delivery for a custom made item. Looks to be hard wearing too. I ordered the base model but may upgrade to a more luxurious mat later. Thank you for the great service. Product exactly as described. Fits perfectly, and looks great. Very good value and great service. Click the button below to add the Volkswagen California Camper Van T5 (2005 to 2015) Front Row Tailored Car Mats (Round Clips) to your wish list.